Treat your piercing to a brand new look with our brand new range of coloured steel open nose rings. These nose rings are made of high quality surgical steel, anodised to give them a choice of jewel colours. This means that the biocompatibility of the steel is unchanged, and they are just as comfortable to wear as plain steel jewellery. But why have plain steel when you can have awesome colours? Open nose rings are a great alternative to other nose rings because they are easy to insert but stay in place. 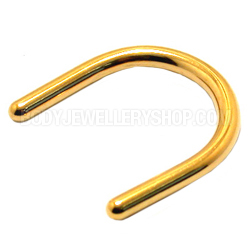 Instead of faffing around with BCRs, you can simply slide these nose rings into your piercing. The flat plate sits inside your nose and the gap is hidden from view, giving the appearance of a smooth, continuous nose ring. 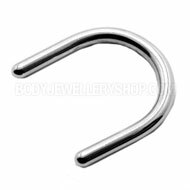 These steel open nose rings are simple and clever, giving you a comfortable feel and a gorgeous look whatever your style. There are six gorgeous colours to choose from, including rainbow stripes that really make a statement! We also have a plain steel open nose ring and a unique white steel open nose ring. This entry was posted in Nose Jewellery, Surgical Steel Body Jewellery and tagged Coloured Steel Piercing Jewellery, Nose Rings, Open Nose Ring, Open Nose Rings, Surgical Steel Nose Rings on April 19, 2013 by Piercing Guru. Keep your nose piercing looking and feeling great with one of our best-selling titanium nose studs. Titanium is a fantastic metal for piercing jewellery and these nose studs are among the healthiest and easiest to wear in your piercing. 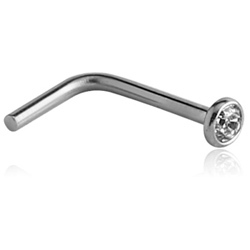 We have a great choice of titanium nose studs, from plain silver ball studs to cute shapes and glamorous jewelled studs. 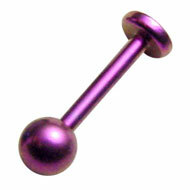 Titanium is the most biocompatible metal for piercing jewellery. It is non-irritating and can actually help shorten piercing healing times. It is recommended for getting pierced with and it ideal for a nose piercing that is sore or taking a long time to heal up. Titanium is also lightweight and comes in a great choice of fun colours. These titanium nose studs have the classic curved shape that is comfortable to wear and easy to insert. They ‘twist’ into your piercing and stay in place really well, so you can forget about them once they’re in. 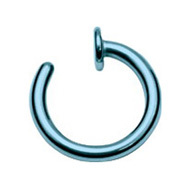 This type of titanium nose jewellery comes in lots of different designs and is a great choice for your piercing. Whether you prefer a pretty jewel or a colourful butterfly, these studs are a great choice. 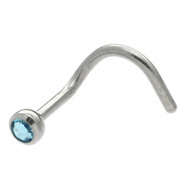 Another option is a titanium micro nostril stud. These nostril studs are essentially tiny labret studs, perfectly sized to fit your nose piercing. They are a little more fiddly to insert than curved studs but offer more security once they are in. They also mean that there is less of the jewellery inside your nose, which is more comfortable for people with small nostrils. If you find that your nose stud tickles your nose or falls out, this type of nose stud is a great alternative. This entry was posted in Nose Jewellery, Titanium Body Jewellery and tagged Curved Nose Studs, Nose Labret Studs, Nose Piercing Stud, nose stud, nose studs, Titanium Nose Studs, titanium piercing jewellery on July 17, 2012 by Piercing Guru. Get yourself a comfortable, stylish new piece of jewellery with one of our Bioplast nose studs. 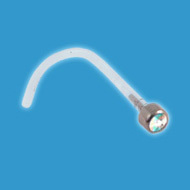 These nose studs are made of Bioplast, also known as BioFlex. 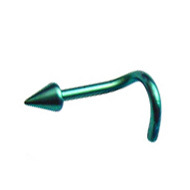 This is a durable biocompatible plastic that is really comfortable for nose piercings. 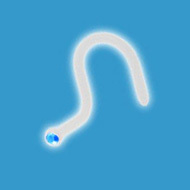 Bioplast is bendy, non-irritating and can reduce healing times. This means that Bioplast nose studs are very easy to insert and they won’t poke the inside of your nose or press uncomfortably on your piercing. So many BJS customers say Bioplast nose studs are the best they have ever worn – it really is a case of once you try them, you’ll never go back to regular metal studs! 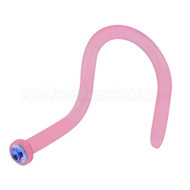 These Bioplast nose studs are bendy and comfortable to wear. They are made from one piece of Bioplast, so you don’t have to fuss around with tiny threaded balls. 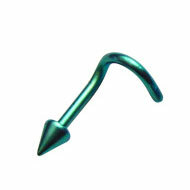 They simply slide into your piercing and once they are in place, you won’t even be able to feel them. Bioplast comes in lots of different colours and we currently have clear, white, black, pink and flesh tone Bioplast nose studs. These studs tend to have smaller jewels than traditional nose studs, so they are ideal if you prefer a simple, discrete look. This entry was posted in BioFlex Body Jewellery, Nose Jewellery, Nose Piercings and tagged BioFlex Body Jewellery, BioFlex Piercing Jewellery, Bioplast Body Jewellery, Bioplast Piercing Jewellery, nose stud, nose studs on May 10, 2011 by Piercing Guru. Nose studs are a really simple piece of jewellery but the material they are made out of can really affect your comfort and your ability to heal a piercing. 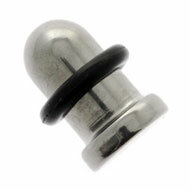 If you have found metal studs uncomfortable I recommend looking at our BioFlex nose studs. BioFlex is a soft but durable biocompatible plastic that is ideal for nose studs. 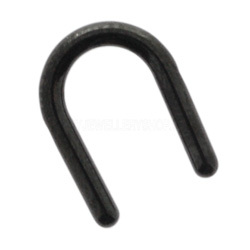 It is very flexible, so the end of the stud cannot poke into your nose and you can barely feel that you are wearing them. BioFlex is also extremely biocompatible, so it is completely non-irritating and can even help to reduce healing times – if your nose piercing just won’t heal you should definitely try a BioFlex nose stud. 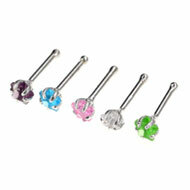 Our BioFlex nose studs come in clear, pink, black and peach and we are always adding new colours. These jewelled studs are very pretty and great to wear. The jewels look small and dainty but still really sparkle. Each colour of BioFlex comes in up to six different jewel colours so you can match them to the rest of your jewellery. This entry was posted in BioFlex Body Jewellery, Nose Jewellery and tagged BioFlex Body Jewellery, BioFlex Piercing Jewellery, Bioplast Body Jewellery, Bioplast Piercing Jewellery, nose stud, nose studs on March 18, 2011 by Piercing Guru. December is just around the corner, so now is the perfect time to start looking for little gifts and stocking fillers – there is plenty of time for buying Christmas presents, so picking up little presents now will make sure you aren’t stuck in the Xmas rush in December. Here at BJS we have lots of great gifts for pierced folks but I think these body jewellery bonus packs make excellent stocking fillers. 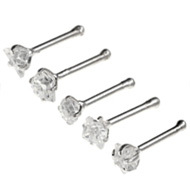 Our nose piercing bonus packs contain a selection of nose studs all for a great price. 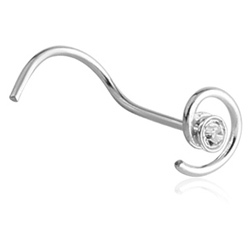 They are a great way to stock up on nose piercing jewellery and come in a range of designs to suit your piercing. Below are just three of the nose piercing body jewellery bonus packs that we have. The different coloured jewels make it easy to update your look and they come in both silver and surgical steel for your comfort. 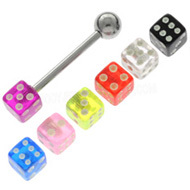 If you can’t decide on one tongue bar to give someone, pick up one of our tongue piercing bonus packs. 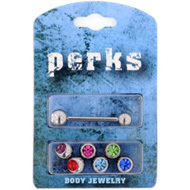 These bonus packs include a tongue barbell with a selection of cool threaded accessories. This means you can swap the accessories or mix and match them with your other jewellery for a coordinated look. 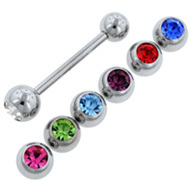 These tongue piercing body jewellery bonus packs are great value and a fab way to treat yourself too. This entry was posted in Festive Body Jewellery, Gifts and Accessories, Nose Jewellery, Nose Piercings, Tongue Piercings and tagged Body Jewellery, gift sets on November 20, 2010 by Piercing Guru. 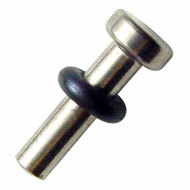 To keep your nose piercing feeling and looking great, you can’t beat a titanium nose stud. 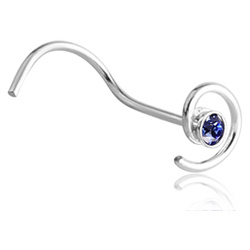 Titanium is one of the most comfortable metals for body jewellery and it is an excellent choice for nose piercings. 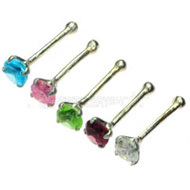 Here at Body Jewellery Shop we have a choice of over 30 titanium nose studs including jewelled and plain studs in a range of anodized colours. Unlike surgical steel, titanium does not contain nickel or other cheap metals. Many people react badly to the nickel in surgical steel and find titanium nose studs much more comfortable. Titanium is also hypoallergenic and can shorten healing times compared to other metals. If your nose piercing is taking a very long time to heal or is often sore I definitely recommend switching to a titanium nose stud. 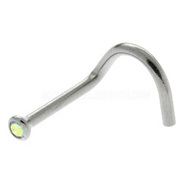 There are two basic designs used for titanium nose studs: curved nose studs and labret-style nose studs. Almost all of the studs available are based on this design. 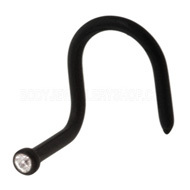 Curved titanium nose studs have a hook shape that many people find very comfortable. 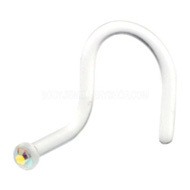 You insert these nose studs by using a twisting motion, so they are easy to insert and remove. 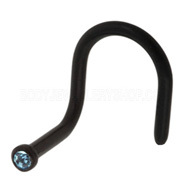 The curved part of the stud sits flush with the inside of your nostril. Below are just three of our curved titanium nose studs. All of these designs are available in lots of other colours and styles. This entry was posted in Nose Jewellery, Nose Piercings, Titanium Body Jewellery and tagged Nose Piercings, nose stud, nose studs, titanium piercing jewellery on October 27, 2010 by Piercing Guru.